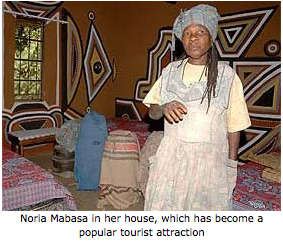 Every night for nine years, Noria Mabasa dreamed about an old woman teaching her how to make sculptures from clay. At the time, Mabasa was only 27 years old and seriously ill from an unknown disease. The disease troubled her from 1965 to 1974. Throughout her illness the dream was always there. One day she listened to it and in the end became a respected, award-winning artist. Vuk'uzenzele visited Mabasa (69) at her home in Tshino, Vuwani where she now lives in a big modern house with a beautiful garden. "After ignoring the old woman in my dream for a long time, my late father came into my dream and asked me why I was refusing wealth from the old woman. He told me I must ask my sister to organise an ancestral ceremony called muphaso." 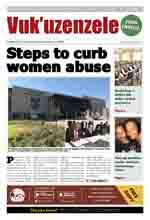 After the ceremony, the disease stopped immediately," Mabasa said. The time had come to start doing what the old lady had taught her. So Mabasa followed her dream by making sculptures from clay. "It was very humiliating for an old woman to be 'playing' with clay in the village. I had to bribe my daughter with R1 to go and sell the sculptures. The first day she came back with R10," Mabasa said. "One day I collapsed and saw the old woman again. She showed me how to make big sculptures," said the dreadlocked granny. She said the spirits told her not to cut her hair. The first big work Mabasa sold was at Vuwani police station. At first she thought they would arrest her for showing them such a big, strange-looking thing. But one of the policemen liked the sculpture and bought it for R10. One night the old woman told her in a dream to make sculptures from wood. A small wooden sculpture made as a gift for a relative in Johannesburg, attracted a journalist's attention who wrote a story about her work. After the story appeared in a newspaper, people became interested in her work. "I started exhibiting my sculptures in Thohoyandou, Johannesburg, Grahamstown and other parts of the country," she said. She has also exhibited in most African countries and in the rest of the world, including France, the USA, Belgium and Britain. Her work can be seen in the Union Buildings in Pretoria, as well as in most major art galleries in South Africa. Mabasa has received many awards, including the National Order of the Baobab from the President. The City of Johannesburg has also named a street in Newtown after her. She says the old woman doesn't appear in her dreams anymore, but communicates with her in voices. "Most of the time I just work on the wood without knowing what I'm doing. I will then hear a voice telling me what it is. It happened when I did a sculpture of the Mozambique floods, Hector Peterson, the women's march and the release of Nelson Mandela from prison," she said. "I am not educated and didn't even know about all these things." Today, Mabasa's house is one of the top tourist attractions in Limpopo. Government is building an art school at her house for more than R1 million where future artists will study. It is expected to open later this year. It is said that to be successful , one must have dreams. This means that to make it in life, you must have goals. For Noria Mabasa it was an actual dream that led to her success as an artist.